When Comic Books Ruled the Earth: Flash Thompson's swingin' send-off party! Oh, wow. Sorry I haven't been chatting up the old comics lately. I'm making one of my own and it's taking all my free time. I take a break from it only to work my day job and sleep. I eat at the drawing table (so to speak; I draw on one of those razzly-dazzly Cintiq monitors these days) just like one of those old school guys who made comics back in the day and then died of alcoholism-related complications well before their natural times. Cheerful, ain't it? Well, here's something that will certainly lighten the mood. Remember when Flash Thompson went off to fight the Vietnam War and everyone at his party looked incredibly mod and gorgeous and they all thought it was a wonderful, happy, pleasant thing he was doing, with no negatives about it whatsoever? It happened in Amazing Spider-Man #47 (April 1967). Here’s a largely cheerful story about a bunch of friends putting on a going-away party for Flash Thompson, who is leaving for the service, possibly to fight in a war in a jungle that pointedly avoids even the suggestion such a thing might be in any way, shape or form at least the slightest bit controversial or even worrisome. Of course, given the time, the implication is Flash has been drafted, but the closest we get to acknowledging that is a few issues back when Pete says something about Flash’s “induction notice,” a term less loaded than “draft notice.” Not a soul even whispers Vietnam or Southeast Asia, and no one seems to think Flash is going to have anything other than a simply fine ol’ time. Of course, criticizing at Stan Lee and Marvel Comics for not taking sides over Vietnam or making an issue of it is kind of like condemning The Beverly Hillbillies for not doing an episode where Jethro gets drafted, loses a foot and joins an anti-war rally in Washington while banker Milburn Drysdale talks the Clampett family into investing in a napalm factory. I don’t think Lee was or is particularly interested in politics, and certainly not in wading into a political Big Muddy and more than likely drowning his company there. He didn’t mind using the Commies as bloodthirsty villains and outright creeps whenever possible, but who at the time gave a rip what a communist thought about comic books? If they even read comics when they weren’t murdering babies, knocking over Asian dominoes or stealing our space secrets, they probably stole them off the racks anyway, and that did nothing but harm to Marvel’s bottom line. Plus, there probably wasn’t a lot of readership overlap between Marvel’s magazines and The New York Review ofBooks where in February of that year Noam Chomsky published “The Responsibilityof Intellectuals.” And Dr. Martin Luther King told 3,000 people at Riverside Church in New York City that the civil rights and anti-war movements were essentially the same struggle and condemned the war in Vietnam as US imperialism in the same month Marvel cover-dated Amazing Spider-Man #47. Check out Time magazine's reaction, and the Washington Post's. You know, those bastions of liberal thought. Not so surprising when you consider a Gallup poll the same month showed 50% of respondents believed our escalation in Vietnam was not a mistake versus 37% who thought it was. The believers were down from 59% the previous year, but still represented a significant majority over the skeptics. This is a little different than outright support for the war, but risking controversy by directly addressing Vietnam and its complexities and uncertainties wasn’t going to sell Spider-Man to the middle Americans buying this stuff for their kids and still largely assured we were doing the right thing halfway across the world. Lee had books to move, and Warren Publishing’s Blazing Combat had recently addressed the war directly with distinct disapproval and quickly folded. In the course of entertaining the heck out of us—its primary purpose—this story acknowledges in the vaguest and safest of terms what couldn’t be ignored and takes no sides. No more, no less. In fact-- YOWZAAA! Look at Gwen Stacy's knockout outfit! I don't know who designed it. Dormammu of Beverly Hills? Purple and blue abstract design, with fishnets and a animal-print coat in decidedly unnatural hues of... purple again. 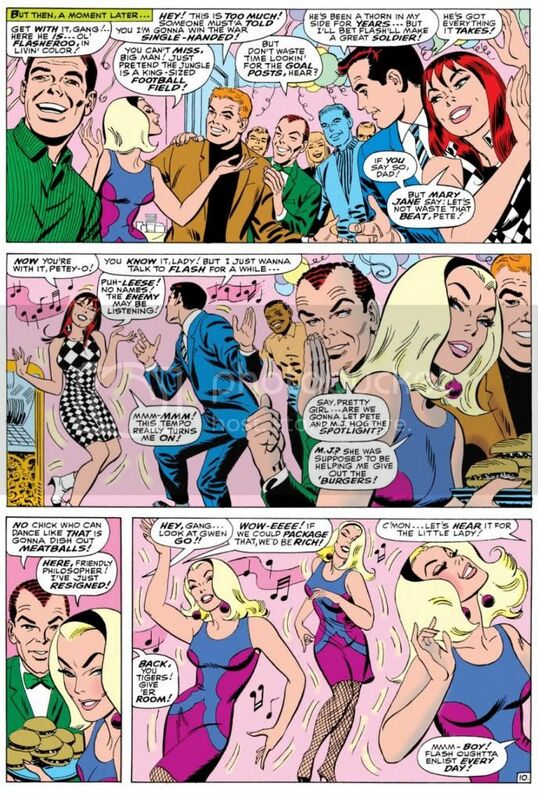 Jazzy John Romita was the perfect guy for this soapy stuff and he visualizes Gwen as the height of mid-60s cool. It doesn't get any better, does it? Yes it does! 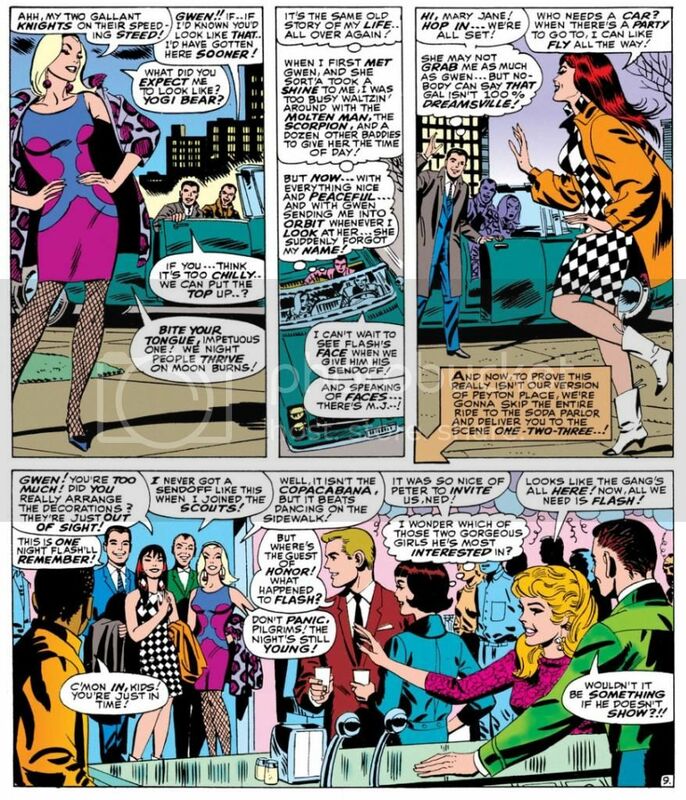 Because here comes Mary Jane Watson in an op-art inspired checkerboard dress and some wild white boots with contrast black toes. Shame about the orange coat, but she quickly dumps it once they hit the shindig. Pretty much everyone there is a sharpie. Smart jackets and ties for the gents, ultra-modern flips and bobs for the ladies. The guest of honor, Flash Thompson himself, sports a brown coat with a black tee for an athletically casual take on dressing up. That guy on the left of the top panel has a Beach Boys-looking striped shirt, possibly by Gant. The only guy who looks anachronistic is poor Harry Osborn, with his green bowtie and jacket like something he borrowed from Barney Fife down in Mayberry, NC. And he's supposed to be a rich boy. He looks as if he popped in from a 1949 issue of Archie's Pep Comics. He's even got Jughead's plate of hamburgers. Gwen steals the show-- much to Mary Jane's displeasure-- with a dance that rivals the one Audrey Horne would do a generation or so later on the premiere episode of Twin Peaks. All eyes on Gwen. Stan's blatantly sexist catcalls crack me up. These are just a few, but they run all through this part of the comic, with Harry and Pete congratulating themselves on having such beauties for girlfriends and Pete secretly leering at Gwen every chance he gets. Don't you wonder what music Gwen's dancing to? This was right as pop was going psychedelic and becoming undanceable, and I doubt anyone wriggled and swayed to folk songs or protest tunes. If this were a TV show of the time, it would be some outdated-sounding jazzy stuff the network squares thought of as "close enough to that rock junk no one will be able to tell the difference anyway." You know, like when Opie needs a little background noise while sweeping the courthouse floor for his dad and flips on a little white transistor radio and upbeat guitar noodling comes blaring out. Then Ope starts doing some kind of frantic moves with his broom still in hand says, "Gee, Pa, isn't this the most?" And Andy's like, "The most WHAT?" But because he's pretty open-minded for a Southern sheriff of the day, he and Helen Crump end up championing the fresh-faced kids at the high school who want to add a couple of the exact same generic rock tunes to the annual play instead of doing the same old "founding of Mayberry" junk the older teachers favor. Anyway, beautifully drawn, hilariously written bit of scene-setting before the issue's bad guy makes an appearance. Kraven the Hunter. You know what? Who really gives a rip about that jackass when you've got these kinds of lovely John Romita pages to look at? Interestingly, Romita is doing a Steve Ditko impression throughout, and even Kraven's face in a few panels looks more Ditko than Romita. Artistic continuity, and at times Romita's line looks so impressively close to the guy's who he's imitating, it's almost as if Ditko himself inked this book. Well, it's a fine book and I wish Lee and Romita had spent even more time just hanging out with the kids. But I guess the readers came for the action, but I'm more in love with the soap opera/character-building sequences during this era. I'd hang out with all of these characters even without the superheroic spider-bite antics. We don't even have to talk politics.